Chenille embroideries on suede are some of the most decorative methods for embellishing that soft and fascinating fabric. No longer is suede to be bought in one or two uninteresting shades; it runs the entire gamut of pastel colourings - blue and pink, grey and mauve, and all the tender greens of spring and summer to the leafy browns of autumn. Suede skins may be bought in two sizes, 22 inches by 21 inches, at 2S. 6d. a skin, or 24 inches by 23 inches, at 3S, a skin. From these pieces it is possible to make various beautiful and artistic adorn-ments for millinery. The woman who likes novelty and quaint-ness, combined with good taste, for her personal wear will find that embroidered suede hat trimmings will meet all her requirements. The effective quality of the velvety chenille is greatly enhanced when beads are introduced, for they give touches of scintillating light which are truly beautiful. If desired, two skins may be procured of the same shade, and a milliner could cut the suede to the shape of any hat, toque, or bonnet the embroid-eress may desire. It is, however, easier to work upon the suede when it is fixed in a frame, and if this method is used, the shape of the trimming required should be tacked in white cotton on the suede skin after it has been stitched on to a coarse canvas. This is then fixed into the frame, and the embroidery commenced. The suede can also be cut into strips to suit any style of millinery which happens to be in vogue. A suede cabochon studded with dull beads embroidered. 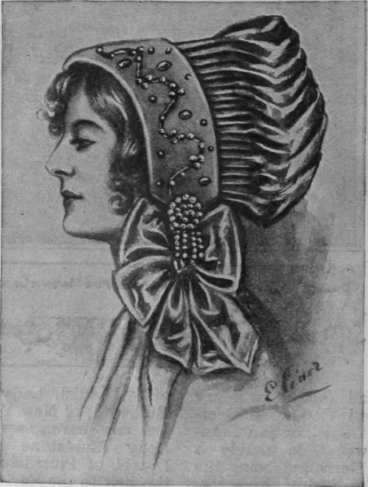 The shape of the bonnet is cut after the style of a Dutch bonnet, the back being composed of glace silk or of suede, whilst a deep band of suede, embroidered in chenille and beads, is turned back from the face. Each side of the band is finished off with a round cabochon with hanging strands of beads, which are threaded on to the chenille, giving a most decorative and Oriental effect. Such a bonnet would, indeed, be a costly item if ordered. But if it is embroidered at home by the clever needlewoman, and then handed to a reliable milliner, the cost will be considerably less, yet the effect will be just as beautiful. For a motor bonnet the strip of suede should measure about 20 inches by 6 inches. Sketch a design on to the suede in tailors' chalk. This need not be elaborate; a few twist and turns, or an odd leaf here and there, form quite an effective design. Thread some beads on to the chenille. For example, gold porcelain beads are extremely decorative when threaded on to mauve chenille, eventually to be stitched on to mauve suede one tone darker. Having threaded the beads, they should be pulled about half an inch apart to show the chenille between. This rope of beads and chenille is now placed over the spiral portion of the design, and stitched down in mauve filo-selle on either side of each bead. This completed, the leaves are worked in mauve chen-ille, using satin -stitch. The centre of each leaf may be studded with two or three gold porcelain beads. Small stars of chenille are also effective when worked in this fashion, with a gold bead in the centre of the star. There is nothing bizarre or vulgar about these exquisite porcelain beads; they are dull and smooth, and always appear in excellent taste. The embroidered suede strip can now be mounted on buckram and the edges turned in, and is now quite ready for the bonnet, with the exception of the cabochon and hanging beads to finish off each end. These effective Oriental adornments can be made in several ways. One is to make a pad of cotton-wool and cover it with suede, on which are sewn gold porcelain beads in any form, shape, or design. Thread some beads on to the chenille, and make tassels or loops to attach to the ca-bochon. Such an addition adds the touch of piquancy to the motor bonnet which is so becoming to most women, if the features are youthful, otherwise it would be best to have the band quite plain, without the cabochon. Another method of making these ornaments is to cut. a piece of cardboard about the size of a four-shilling piece. Cover this with a piece of cotton or linen. Embroider a piece of suede to cover this, a star in the middle, with a centre bead of dull gold and several circles of beads around. A fringe of beads may finish off these ornaments. These cabochons may also be the sole trimming on a Napoleon hat, cut to the shape of a cockade, embroidered in beads in multi-colours on to black satin, and are wonderfully effective, especially if small glass or ruby beads are chosen. Wooden beads which are dyed in all colours are fascinating. A wonderfully rich and beautiful green can be obtained in these wooden beads, whilst the white ones have the appearance of ivory, and there is a good shade in brilliant rose pink which looks well on grey suede with silver beads. A very artistic band for a hat can be made by cutting a strip of suede " on the cross," size about 24 inches by 6 inches. 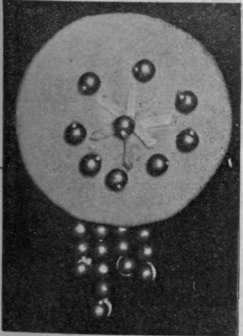 Sketch out the design in tailors' chalk, and after threading the beads on the chenille, and separating them to show it between each bead, sew this on to the spiral design. Feathery leaves may be worked in chenille, and groups of gold beads may be sewn on various parts of the suede, all adding to the artistic effect. When the embroidery is completed, the suede should be folded in half, and cut all the way round to form a fringe, whilst one end may be caught in a fold and fastened down with two beads, leaving the fringed suede to fall beneath them. This makes a complete trimming for a suede hat, or even for a fine straw or satin hat. Such a band is suitable for wear on the smartest occasion, or, worked in dull beads, may make a striking and beautiful trimming for the more serviceable sporting hat. If desired, bands for toques may be embroidered in wooden beads instead of porcelain. Also tiny glass beads worked in a floral design are effective, but perhaps not quite so striking as the larger beads, on the suede. But the choice of beads is endless. 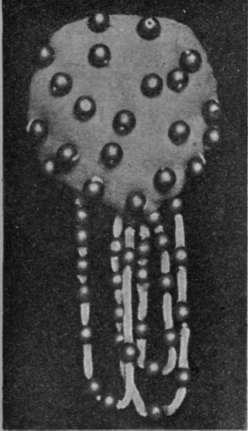 Seed beads, large beads with a dull surface, glittering beads of gold and silver, opaque beads of wood, and beads of chalky whiteness - Indian, Roumanian, and beads from Egypt - offer the embroideress ample opportunities for selection, no matter how exacting her desires may be.